Watch a video clip about wolves and find out why playtime is important. Listen to a wolf howl. Where do wolves live? What do they eat and how do they catch their food? Why do wolves howl? Find out the answers to these questions and many more in this fascinating book. Easy-to-read text is accompanied by full-colour photographs and step-by-step visual explanations of topics including ‘Fur’, ‘Pack life’ and ‘Baby wolves’. 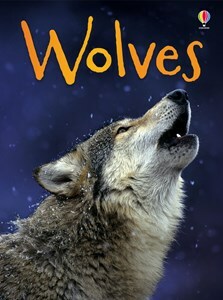 Includes a full glossary and internet links to exciting websites to find out more about wolves. I have this book and i love it! I'm a big fan of wolves.